On November 7th, we carried a report from Mundo Deportivo, who claimed that Barcelona are not interested in signing David Luiz either in January or next summer. It was also pointed out the Brazil international has been linked with a move to Camp Nou ever since he was at Benfica. A ‘Top Secret’ report from the same newspaper now explains in detail how the Catalan club said ‘no’ to the signing of the centre-back in 2013, when he was at Stamford Bridge during his first spell with the Blues. The La Liga winners had a detailed report about the defender and it was recommended to them not to sign him, five years ago. In the summer of 2013, the Spanish champions were after Thiago Silva, but PSG were unwilling to let him leave and the situation forced them to look elsewhere, which is when Luiz emerged as a target. Former director of football Raul Sanllehi travelled to Brazil to watch the Chelsea player in action during the 2013 Confederations Cup. However, there was no unanimity amongst the sporting leaders to make an approach for him then, even though Dani Alves and Neymar recommended his signing. 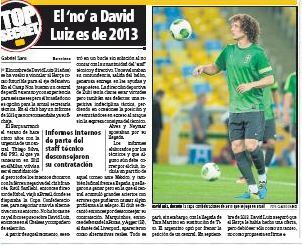 That remains the case and Mundo Deportivo seem very clear to get a message across: Barcelona are not interested in David Luiz.